by machine stitching vellum on top. The Iris die is by Frantic Stamper and called Mix and Match Irises. 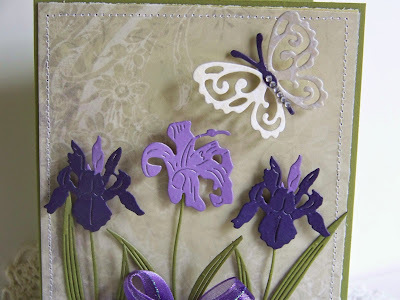 that you can mix and match with Frantic Stamper Stems. There are several other flowers to choose from, too. You purchase the stems and the flower heads separately. then colored and shaded in with your pens and/or watercolors. 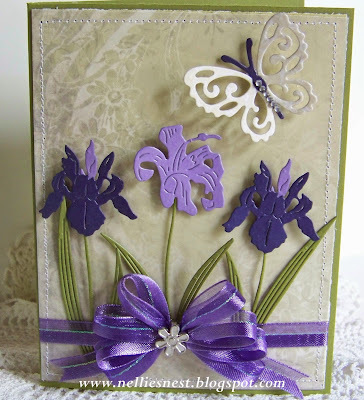 I also used a butterfly by Wild Rose Studio called Little Butterfly! I love the detail and the size! When in the Dies R Us store, enter in the word "butterfly"
to select from in various styles and sizes!! to see Alicia's inspiration project! with 5 prizes given out to five lucky entrants. All you have to do is enter the challenge with an anniversary card!